Paint one of the walls in your living room to add an accent wall. Check with your property owner first though to find out if it's ok, or at least what it will cost from your damage deposit. If you can't paint your walls, hang a few posters. Go with a theme as random posters will just look cluttered. 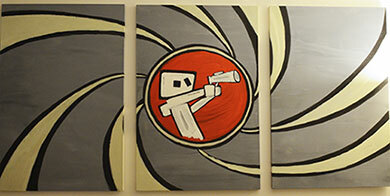 Try a triptych (3 panel) art piece to cover more area and make things interesting. Add lighting. Most apartments are not well lit. Some cool lighting can make a big difference. Dimmable lights can really change the atmosphere. At the time of writing, this Lutron TT-300H-WH Electronics Plug-In Lamp Dimmer was under $15. Check out Ikea, Wal-Mart or Target for some low cost options. Add a plant to the corner of your living room. A simple plant can change the whole look of a room. Just don't forget to water it. Parlor Palm, Peace Lily and Jade plants are all easy to maintain. Read our article, Great Plants for Anyone and How to Care for Them for more tips on plants.